FOX Sports Midwest is your television home for Cardinals baseball. 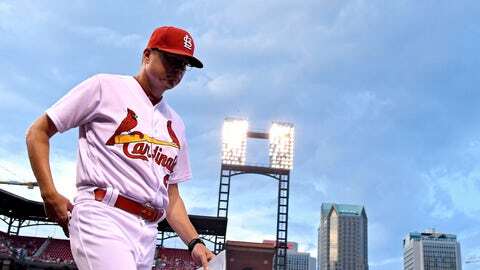 FOX Sports Midwest is in its 26th year as the Cardinals television partner and its ninth as the exclusive television home of Cardinals baseball. FOX Sports Midwest will televise the vast majority of the regular season games along with 15 Spring Training games in 2019. The remaining regular season games will be carried as part of Major League Baseball’s national TV packages with FOX, FS1 and ESPN. The regular season TV schedule will be announced in February or March. FOX Sports Midwest also airs the Cardinals Live pregame and postgame shows before and after each of its telecasts along with Cardinals Insider, a weekly 30-minute show produced by the Cardinals. FOX Sports Midwest’s Cardinals telecasts are available in most of Missouri, central and southern Illinois, most of Iowa, southwest Indiana, Arkansas, Oklahoma and parts of Kentucky, Mississippi and Tennessee (see detail below). For more information e-mail midwest@foxsports.net. FOX Sports Southeast and FOX Sports South/FOX Sports Tennessee will carry most regular season and exhibition Cardinals telecasts in parts of Tennessee, Kentucky and Mississippi. The remaining games are available on an alternate channel on some cable systems. Some games are not available in some areas. The FOX Sports Tennessee/South and FOX Sports Southeast schedule will be announced in February or March. Cardinals games are available in western Kentucky via FOX Sports South and its alternate channel. We encourage you to contact Dish Network to request that FOX Sports South be added to Dish Network’s America’s Top 120 Plus lineup in western Kentucky. In Arkansas and Oklahoma, FOX Sports Midwest Cardinals telecasts are available and shown on an alternate cable channel, sometimes labeled FOX Sports Plus — rather than the primary channel designated for FOX Sports Southwest/FOX Sports Oklahoma. AT&T U-Verse subscribers in Arkansas and Oklahoma can receive Cardinals games (on channels 748 and 1748) by subscribing to the HD Premium tier. DirecTV subscribers in Arkansas and Oklahoma can receive Cardinals games (on channel 671) by subscribing to the SportsPack. Dish Network customers in Arkansas and Oklahoma can receive Cardinals games (on channel 418 or 412-08) by subscribing to the Multi-Sport package. The Fox Sports Plus schedule for Arkansas and Oklahoma will be announced in February or March.